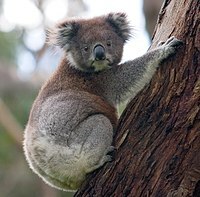 The Koala is a marsupial who lives on the coast of the Australia. The koala has got large, round, hairy ears, a large head, small, black eyes and a big, black nose. It has got a grey fur with small white tufts on the chest: the upper part of the body is grey. The hair is long, soft, woolly and, because of the diet, smells like eucalyptus. The body is stocky and it hasn't got a tail. The feet have five fingers, with sharp claws that allow him to climb trees,on witch in small groups . The scientific name is "Phascolarctos cinereus" and is an Australian marsupial mammal. The koala spends most of its life on eucalyptus trees. Towards evening, start your own meal made up of leaves and buds of eucalyptus, usually consuming about half a kilo a day. Sometimes it falls to the ground to change the tree or to promote digestion by eating bark or pebbles. The koalas are found mainly along the east coast of Australia, from Adelaide to the base of the Cape Peninsula of York, and where there is enough rain to support the eucalyptus plants, the only source of livelihood of the koala. Koala fossils are rare, but some have been found in Australia, dating back to the Miocene. During this era, the Koala diet specialized in one of eucalyptus, when tropical forests were replaced by eucalyptus ones, due to the lowering of temperatures. Some fossils prove that up to 50,000 years ago giant koalas occupied the southern regions of Australia. The evolution of the species has not been completely clarified, the only thing that has been thought of is that Koala's progenitor was a marsupial accustomed to digging dens. There is a painting by John Butler, which fuses a very cute Koala puppy. In 2016 he released a film about a kind and selfless koala who likes to venture out into the desert. This film is called "Billy the Koala" and was made by Deane Taylor. This page was last edited on 14 April 2018, at 08:54.